Ootsa Lake Odyssey: George and Else Seel—A Pioneer Life on the Headwaters of the Nechako Watershed, by Jay Sherwood. Caitlin Press, Halfmoon Bay, 2016. This biographical account of the Seels, a German-Canadian family who lived in BC’s central interior, offers fascinating details about pioneer life, settlers’ interactions with First Nations people and resource-based development. Maps, photographs and most remarkably, the poetry and diary entries of Else Seel, compliment the narrative. 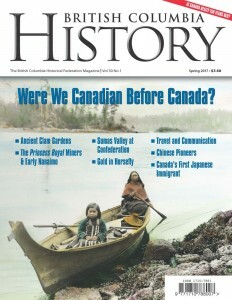 The full review is available in the spring, 2017 issue of BC History. by Kay Johnston. Caitlin Press, Halfmoon Bay, BC, 2016. Moses and Sarah Antone named their daughter “Velma Doreen” when she was born in 1931 at St. Paul’s Hospital in Vancouver, but everyone called her ‘Mazie.’ A strong advocate for First Nations people, Mazie spent her early childhood on the Capilano Reserve in North Vancouver. Her family was part of the Squamish Nation and their shoreline home was on land where the Lion’s Gate Bridge and Park Royal Shopping Mall stand today. Mazie was an elder when she agreed to share her remarkable life story to author Kay Johnston. The result is an important and revealing biography of an aboriginal woman’s life and fight for justice—made more powerful and intimate by several paragraphs throughout the account in Mazie’s own words.